Do you love "Will and Grace" or maybe "American Horror Story", possibly the movie "The Help", but definitely "Sordid Lives"? Well we have the show for you! Lets start off pride week right with the one and only Leslie Jordan! 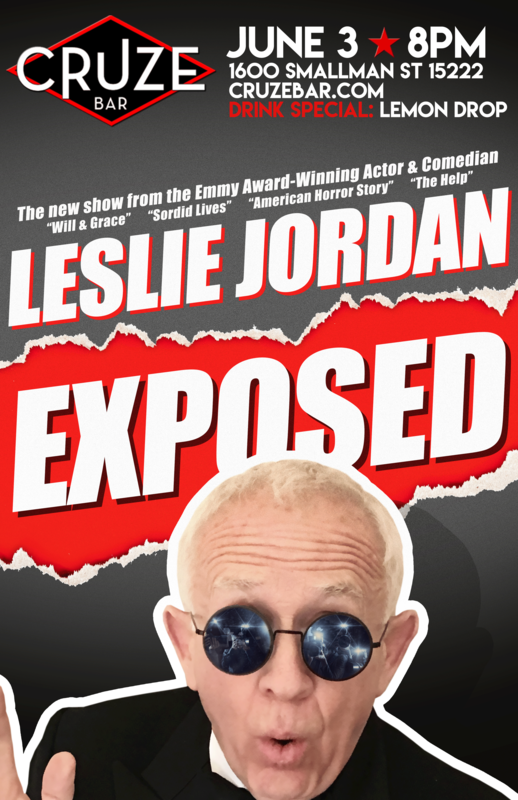 As the celebrated author and star of his own HBO Special (“Pink Carpet”); Leslie Jordan remains consistently sought after as a Guest Star on every imaginable form of episodic, comedic television (TV Land’s “The Ex’es”, Fox’s “Raising Hope”, Disney Channel’s “Shake It Up!”, and ABC’s “The Neighbors”. He enjoyed a star turn in the third season of FX’s instant classic “American Horror Story” opposite Hollywood heavyweights Jessica Lange, Kathy Bates, Angela Bassett, Sarah Paulson and Francis Conroy. Additionally, he recently appeared as a cast member/house occupant in the smash reality competition “Celebrity Big Brother UK”. Leslie Jordan has conquered the international stage with sold out runs in Mexico, Canada and the U.K., and remains an in-demand mainstay as a Stage / TV / Film performer, voice-over artist, fund raiser, spokesperson, out artist, equal rights activist and all around Southern Baptist celebutante. He is very excited to come kick off Pride with us here in Pittsburgh! He has sold out shows across the country so get your tickets now! Cruze Bar 1600 Smallman St.